Playing with light was cool already, but there are tons of other cool opportunities ... like an active ambient light at a PC or TV. The idea behind this is to extend the colors of the border area of the screen even further at the wall behind it. This way an illusion of an even larger screen is created. Sure, this area will not show detailed pixels but it's not needed anyway as the human eye only can see sharp in the center and reacts more to movement or color in the border areas. 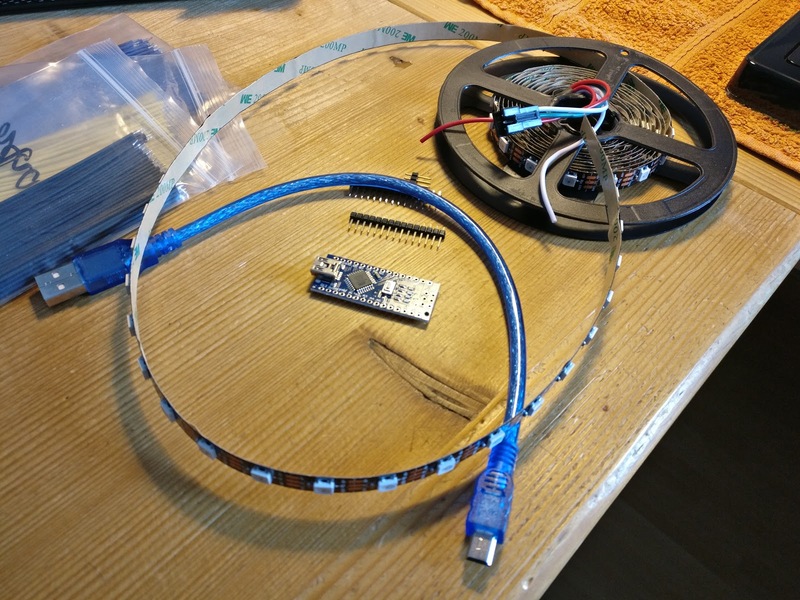 All in all the material cost for this project was less than 15 € considering that a monitor was already available as well as the tools like a soldering iron. The first step was to get the LED strips to the back of the screen. Usually, they come with tape on the back side already, so no problem at all. Just measuring the right length and cutting at the lines. 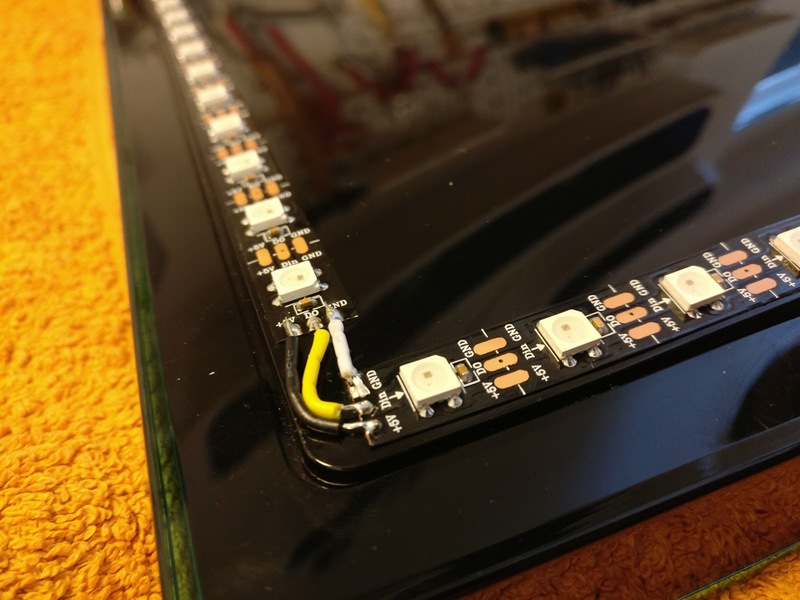 When sticking them to the back of the screen, keep an eye on the little arrows (they need to go all around in one direction) that indicate the direction of the programmable LEDs so the separated pieces will work together again. 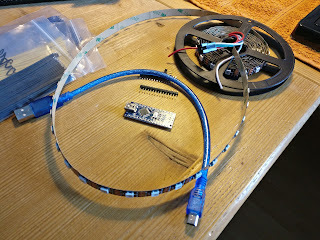 The next step was to connect the LED straps again with some short cables and some soldering so that a full circle of "one" strap gets together again. There are three connections to be made at each cut point: Power, Ground, and Data. Connecting the Arduino board was the last step. I was soldering the connection cables directly on it and covering it in a shrink tube afterward. 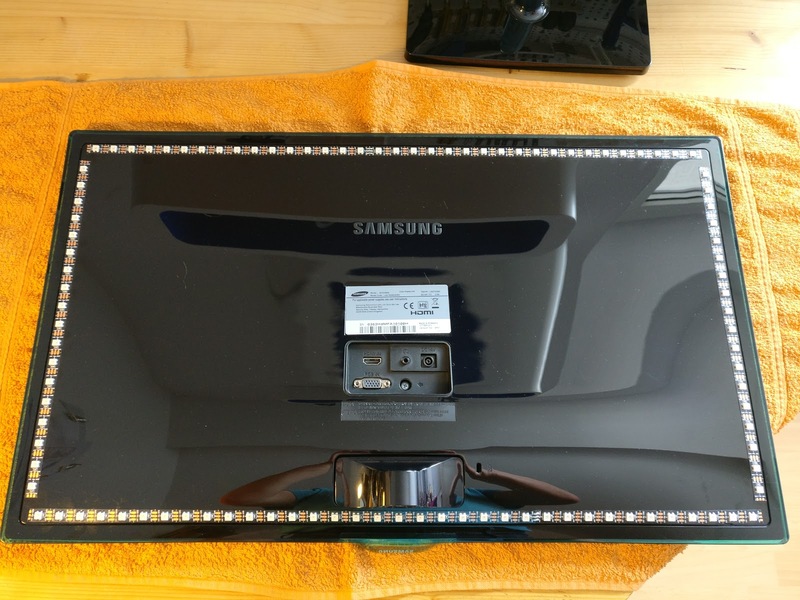 On the software side, there needs to be software set up and pushed to the Arduino board and there needs to be software running at the PC to catch the colors at the border area and send them to the Arduino in order to light up the right LEDs in the right color. For the software at the Arduino, I was using Adalight which uses the FastLED library. Only a few settings had to be made here like the number of LEDs and the COM-Port the Arduino is connected to the PC. Just a hint: Do not choose the wrong chip settings for the Arduino board as I was doing at my first attempt ... which lead to overheating and destroying the board. On my PC I use AmbiBox. This software has to be configured in order to address the right LED corresponding to the position of the colors at the monitor. In my case that means, the LEDs starting at the bottom left of my monitor, running clockwise around it without any gap at the bottom for a stand or something like this. 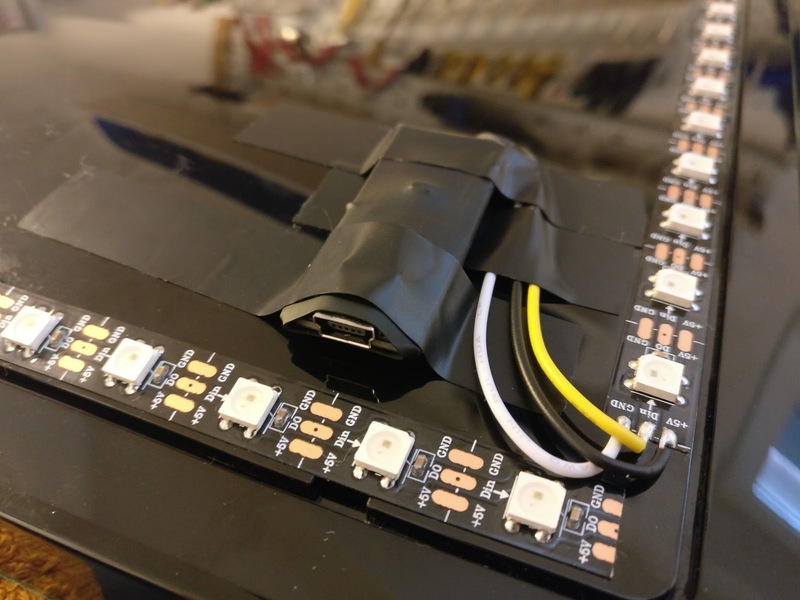 These settings will differ depending on the monitor used for the project and the orientation of the LEDs at which they were mounted to the monitor. I will not go too much into details regarding the software as there are tons of tutorials out there. This software needs to always run in the background in order to capture the colors at the border area of the screen and send them to the Arduino to display the corresponding colors at the LED strap. The effect of the ambient light on my PC is astonishing. Regardless if watching YouTube videos or playing computer games, it is a great extension and for very little money. 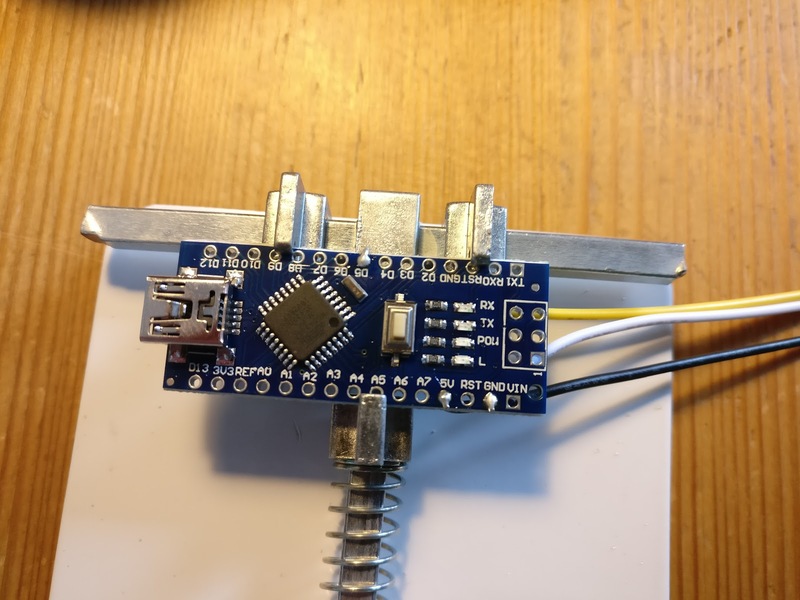 Also, it has been a very interesting DIY project and actually the first one for me to get in contact with Arduino, which I am sure, many more Arduino related projects will follow.